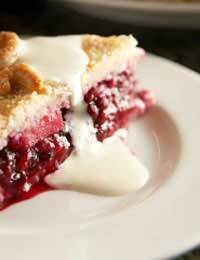 If you spend a few hours baking fruit pies and storing them in your freezer you will be rewarded with a plentiful supply of desserts for family meals. A family day out can be fun but expensive. Why not take the family fruit picking? Not only is this a day in the fresh air for your children but the fruit is in plentiful supply and cheaper than you will find in the shops – and fresher! You may have inherited fruit trees and bushes when you moved into your home or you may be a keen gardener. After enjoying watching the trees and bushes bear fruit it is an added pleasure to be able to turn the fruits into meals for your family. If you have the space why not plant a gooseberry or redcurrant bushes ready for your own supply of fruit fillings? Purchase fruit for your pie making sessions when it is cheap and plentiful in the shows. Special prices, buy one get one free and other such offers will add to your family meals without breaking the bank. Remember that this also includes baking products such as flour, butter, sugar, margarine, dried fruits and disposable pie dishes. Give yourself the treat of a day just to bake and fill your freezer. Shop ahead of the day so that you do not need to leave your home and can dedicate yourself to the task. Check out your favourite recipes and make sure that you have enough ingredients. If you have young children at home give them some four and margarine, cover the floor with a plastic sheet and let them make their own pastry. This will keep your child happy and you free to bake your pies. If you do not enjoy making your own pastry there is no shame in purchasing ready-made pastry. This can be purchased from the freezer section or from the chiller cabinet in most supermarkets. Varieties include puff pastry, short crust pastry, sweet pastry and filo pastry. For short crust pastry take 200g of plain flour and 100g of margarine or butter. Place both into a bowl and using your fingers tips only (not your whole hand) rub them together until they resemble fine breadcrumbs. Add a pinch of salt and several tablespoons of water. Mix until you have a stiff dough adding more water if required. If you add too much water and the mix is wet try adding a spoonful of flour to balance the mixture. Put the pastry in cling film and place into your fridge for thirty minutes to chill. Next, place on a floured board and roll out the required thickness. For a sweet pastry add 50 g castor sugar to the flour before adding the butter or margarine. Add a beaten egg before binding together with the water. Take four Bramley apples, these are the ideal variety for pies and desserts, peel, core and slice them. Place in a pan with a tablespoon of water and a tablespoon of castor sugar and a pinch of cinnamon. Gently simmer until the apple is partially cooked. Do not overcook as the filling will still be cooking when you bake your pie in the oven. Wash the rhubarb and strip away any thick blemished outer layers. Cut into one inch pieces and stew with a little water and sugar to taste. You may find that some soft fillings can go straight into the pies with hardly any cooking at all. Always taste the fruit as the amount of sugar needed can vary. After placing the topping on your pies brush over an egg wash (an egg beaten with a little milk) and then sprinkle with granulated sugar to obtain a brown and tasty crust.